Wind turbine manufacturing is constantly being refined to keep wind farms operating effectively in the competitive energy market. Now with a vast selection of solutions out there, it is necessary to compare and contrast how turbines stand up against each other in performance and reliability. Thanks to the wealth of detailed information available in the WindStats database, this report includes like-for-like comparison data. 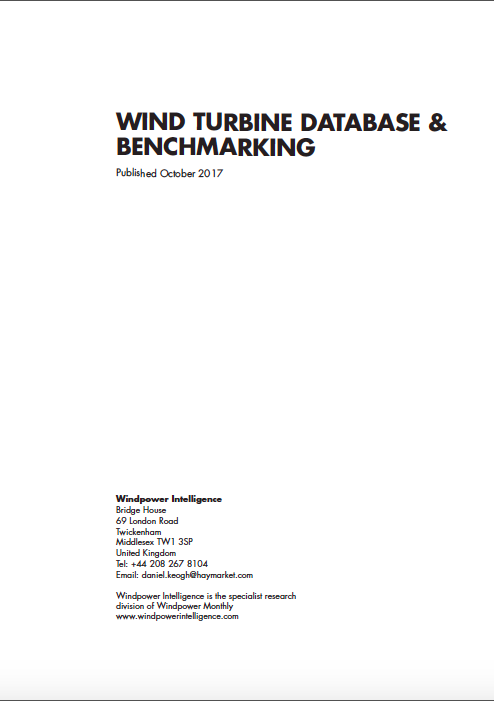 It contains benchmarking information on turbine energy production, links to a spreadsheet of all turbines commercially available worldwide, and market share information based on actual wind farms (i.e. 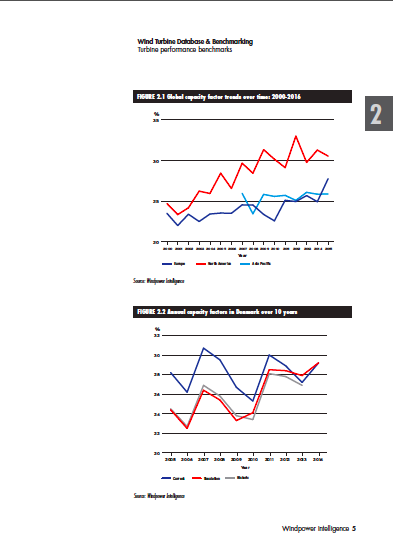 not from manufacturers' sales figures). 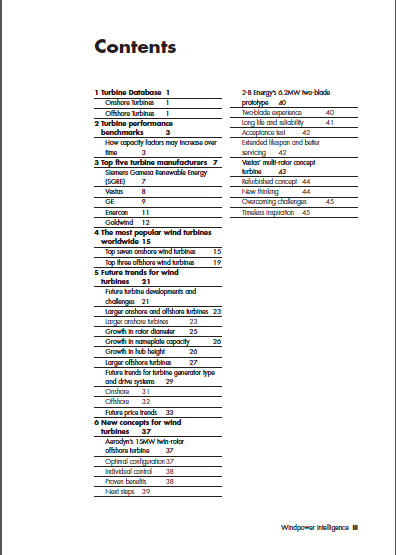 This report includes a database of 633 commercially available turbines, with 12 key details for each turbine. It also includes benchmarking information on the real-world performance of eight turbine models in Q1 2017. 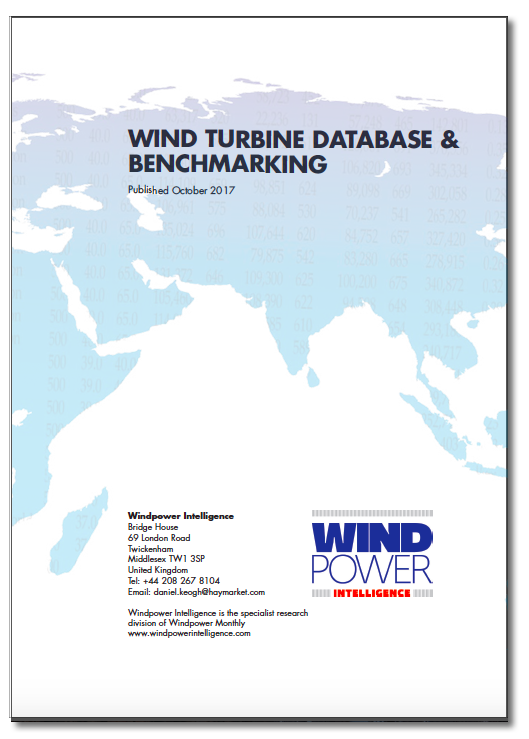 The report outlines market presence for some popular turbine models, provides expert reviews of the newer models, and analyses turbines’ capacity factor trends and key technical developments, as well as manufacturers’ business strategies. The information contained in the wind turbine database was collected by Windpower Intelligence from publicly available information on the wind turbine manufacturers’ websites. Energy production and stop-hours figures for Q1 2017 are extracted from WindMax, a quarterly journal publishing data and technical articles on wind turbine performance. 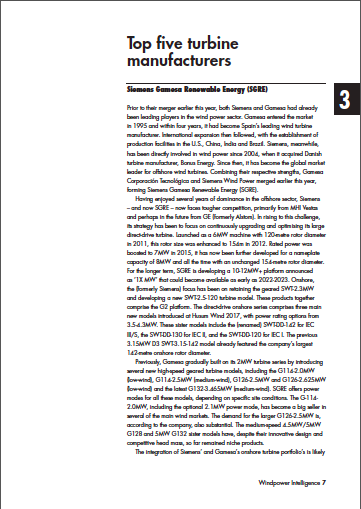 The Windpower Monthly Awards are an annual editorial review conducted by Windpower Monthly. Figures on the geographical presence of each turbine model are derived from information contained in Windpower Intelligence, a database tracking activity at 24,000 wind farms worldwide. Future trends for wind turbines contains information previously published in Windpower Monthly or the Wind Turbine Trends report published by Windpower Intelligence in April 2017.